As I mentioned in my last post, last weekend I made a few healthy additions to my lifestyle, things I felt like I could manage. The first was guzzling a full glass of water before getting up every morning, and the second was making sure I ate a healthy breakfast every day. I also started to make sure I took vitamins every day. This meal was about the last one—trying to eat more raw foods. Cooking foods can make them more delicious, but can also destroy valuable nutrients and enzymes. That’s not to say you should never eat anything cooked, but adding more raw foods to your diet (such as fruits, vegetables, and nuts) can significantly up the amount of benefits you’re getting from your food. Of course, the best way to really get the most out of your food is to make sure you’re buying local and organic, since the longer since a food has been harvested, the more it loses. That’s not always feasible—either financially or availability-wise—but I am trying to get certain things organic, such as apples and carrots (two of the worst pesticide-contaminated foods). 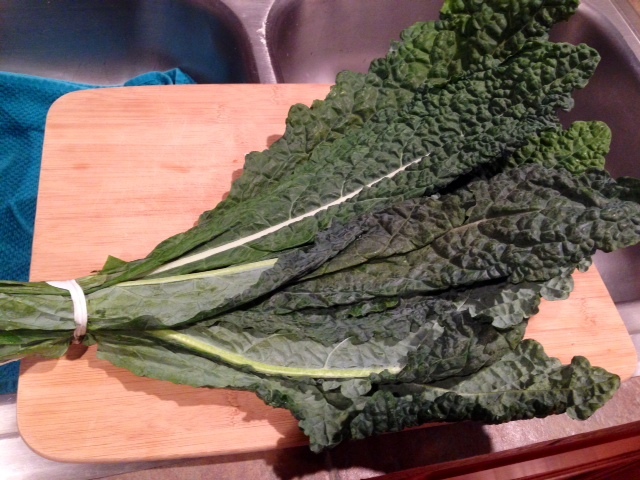 This dino kale was in my CSA box, so it’s both local and organic. Rather than sauteeing it up like I normally do, I decided to puree it with some raw walnuts, garlic, salt, olive oil, and a little ground flaxseed for a different take on pesto. Toss with some curly whole wheat pasta, and you get the best of both worlds—cooked whole grains with a potent creamy raw sauce. Set a pot of water to boil, then add some salt and the pasta. Cook according to directions, minus a minute or two (al dente is best, particularly for whole wheat pasta). Remove the stems from the kale (I practically filleted them like steak), and roughly chop up the leaves. Mince up some garlic. 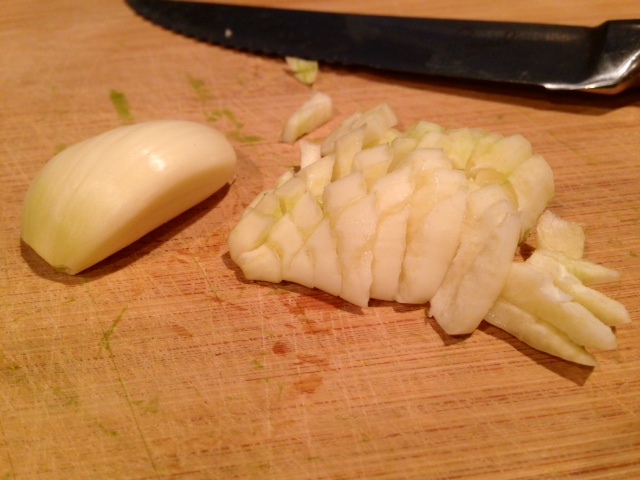 It’s better for this dish to use fresh garlic, not the kind in a jar, but either will work. Throw the kale, garlic, walnuts, some parmesan, sea salt, lemon juice, ground flaxseeds, and several glugs of olive oil (or flaxseed oil, if you have it) into a food processor. Processor on high until you get a creamy pesto. 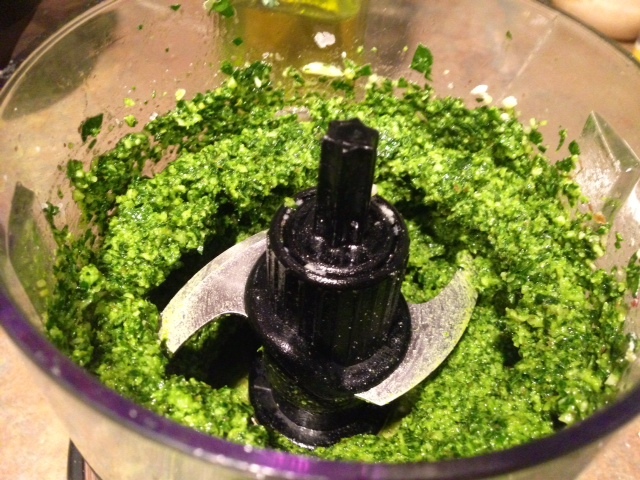 You may have to do a first batch, then add some more kale to the food processor once it’s reduced in volume some. 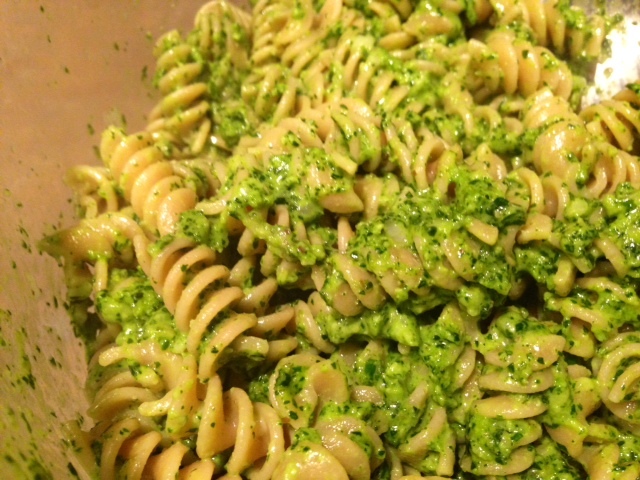 Reserve about a half cup of the pasta water, then drain the pasta and toss with the pesto (a little more olive oil or some butter wouldn’t go amiss). Serve hot and fresh, but it’s great leftover too. It has some bite from the kale and fresh garlic! Set a pot of water to boil. Once boiling, add a handful of salt and the pasta. Cook according to the directions, minus a minute or two (you want it al dente). 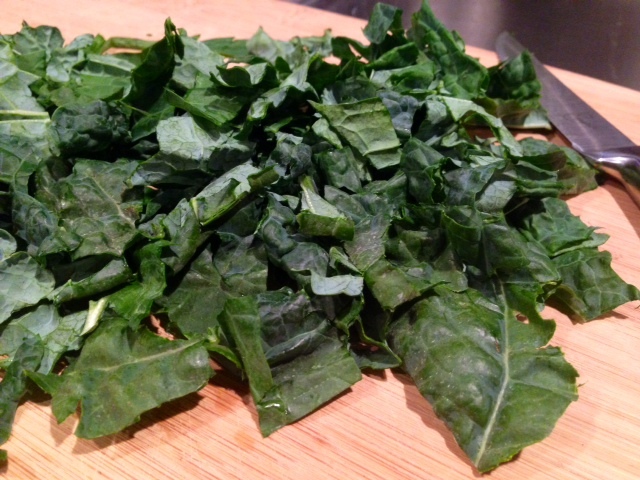 Remove the stems from the kale and roughly chop it, then add to the food processor. 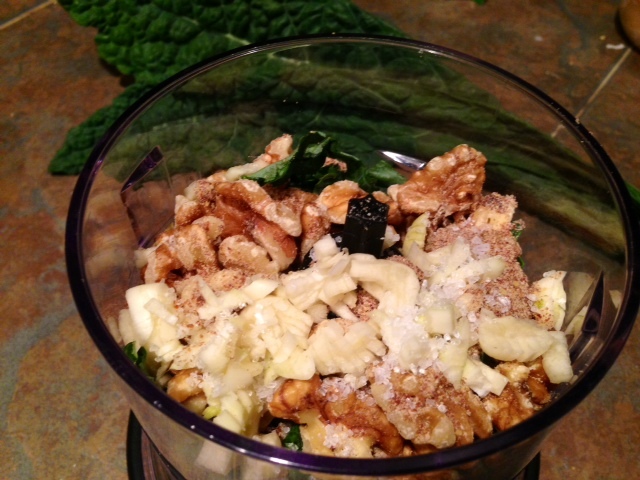 Mince the garlic and add it, the raw walnuts, some cheese, sea salt, ground flaxseed, lemon juice, and olive oil. 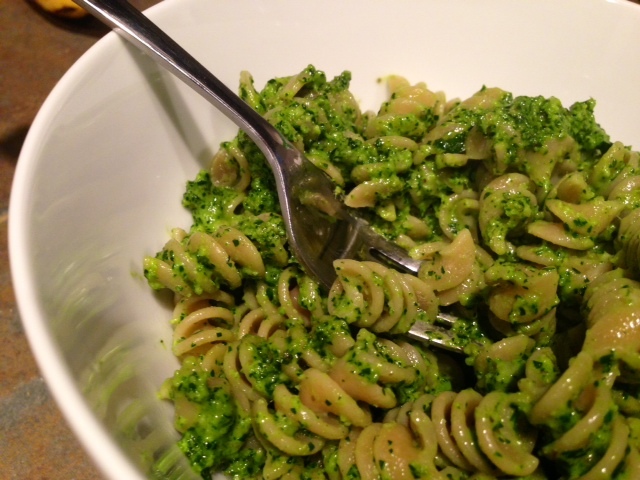 Process until the pesto is good and creamy, scraping down the sides as necessary. It’s okay for it to be a little thick, you’ll thin it out with the reserved pasta water. 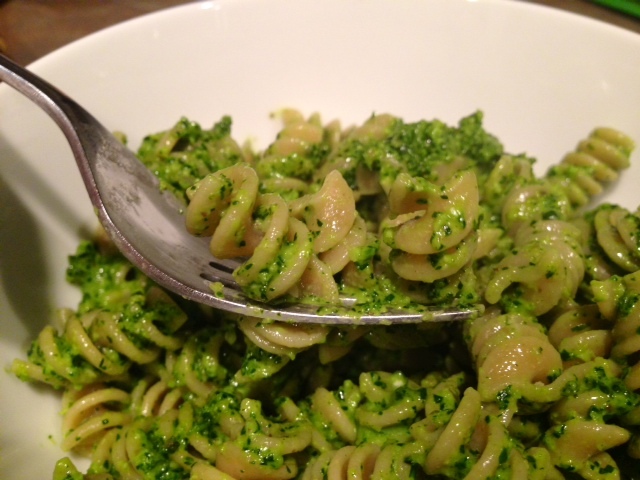 Add the pesto to a large bowl, with some more parmesan and a tablespoon of butter (or some more olive oil). Reserve some pasta water, then drain the pasta. 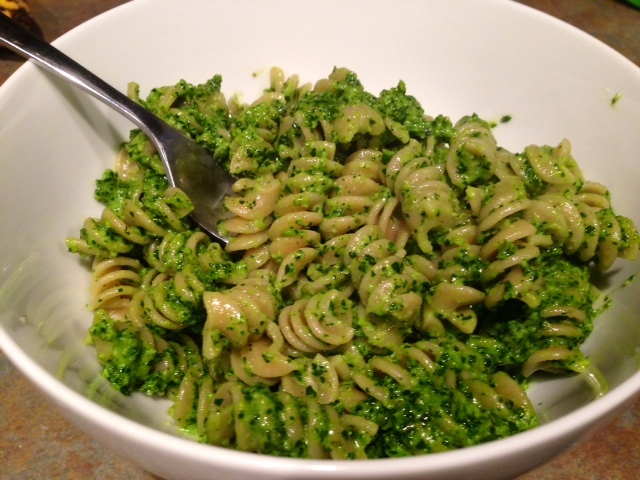 Add to the large bowl with the pesto and toss to coat. Serve hot and fresh, but it keeps well for about a week.